I find Chris Christie to be a formidable and entertaining individual -- I think he'd make a great anti-hero for a "House of Cards"-type television series. He's charismatic, quick-witted, highly capable... and basically without an ethical compass. This means, in today's climate in which the worst rise to the top, he is a very serious contender for the American throne. So, as part of a series in which we examine various presidential contenders, we'll be looking at Christie's astrological weather for election day 2016. 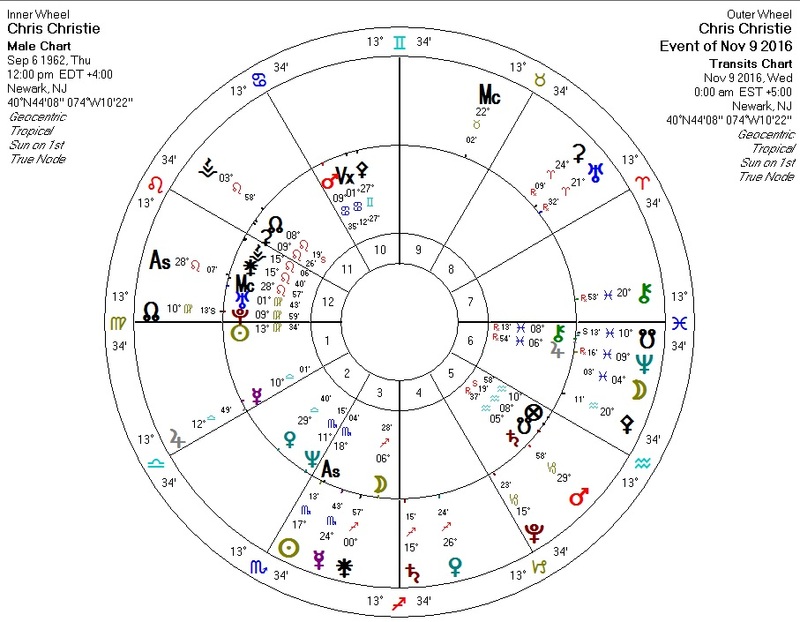 This is Christie's chart (no birth time available as yet) with transits for immediately after what I assume will be election day (Nov 8 2016). It generally bodes well for him. Transiting North Node conjunct Christie Sun and Pluto: expansion and/or aggrandizement (North Node) of self (Sun) and personal power (Pluto). Transiting Pluto trine Christie Sun: Power is most certainly on his side this year. Not pictured: his first solar return (a la Dietrech Pessin) has a progressed Pluto tightly conjunct Christie's Sun. Again, an indicator of power and personal upheaval and possibly a great deal of it. Transiting Saturn square Christie Sun: squares from Saturn are generally challenging, but this could also mean the assumption of new authority for Christie. Transiting Jupiter conjunct Christie Mercury: Good (Jupiter) news (Mercury) around this time. Because Mercury rules Christie's Sun, he's in a (metaphorical) period of expansion. This bodes very well for him, but maybe not for his already gargantuan waistline. There are some other conjunctions happening here which may or may not temper the very strong positive transits he has going here: the transiting South Node and Neptune over his Jupiter may mute some of the energy here. Overall, however, the picture for him on election day is decent. Conclusion: if Christie gets on the Republican presidential ticket for 2016, his chances of winning the general election are not bad at all. January 13, 2014 at 8:35 AM http://starlightnews.com/wordpress/2014/01/christie-crumbles/ in which an astrologer declares Christie's 2016 chances to be zero. I do not dismiss this opinion -- we'll just have to see.